I use medium size on Pearl Izumi PRO and ELITE lines. This one fits me a little tight on XL size. Very slim line. It is a realy good springfall jersey. Exelent finishing and technical clothes. I had ordered a second one. Okay, I use to never ride in the rain or cold even semi cold but then I got a pair of Castelli NanoFlex tights and they worked so well I followed that purchase up with the NanoFlex arm warmer and now this Perfetto Light jersey. I should have purchased two of them becasue I use it just about everytime I ride. If it's colder out I use a merino base layer if it's warmer I use a light base layer or nothing at all. 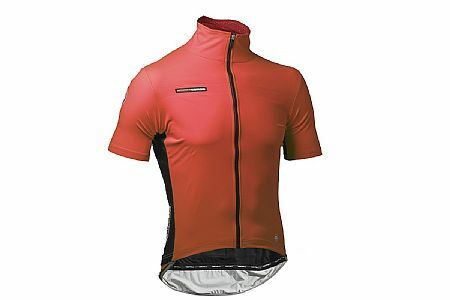 The fabric on this keeps the wind and rain off you yet breaths so well it feels like you are riding on a nice summer day with just a light jersey on even in the rain. Fanatic!!!! Nice lightweight and a great race fit. I bought the red version and I am not disappointed. Fit is excellent, a point of concern with most people saying to buy a size up compared to other companies. It's tight but not in a bad way. Constructed very well and is really comfortable. It's very bright in color and should keep me visible. Since this is my first Castelli Jersey I am very pleased with it and hope it lasts a good long time. I really like the Corsa Rosso level, it just feels like quality gear and definitely looks good. Light while blocking wind and rain. Thinner than gabba but works the same way. Purchased XL but I couldn't even get my arms into the sleeves. Probably would not have kept it anyway, because it seems way to warm for Los Angeles weather. No need for a windbreaker. Works great with a light baselayer and you're good to go.